Kamakura is pure Japan. Often called “the little Kyoto”, Kamakura has hundreds of temples scattered around the hilly, green city and is only 1 hour from Tokyo by train. Kamakura is also where the first samurai government was established in 1185. The very first shogun, Minamoto-no Yoritomo, was handsome, fashionable and sophisticated. He built a political powerhouse that worked through logic, systems and contracts. These concepts seem quite reasonable to us now, but at the time his way—the Kamakura way— was a new style of governing in Japan and quite advanced for its time. His spirit can still be found in the residents living here today. They are cool, dignified and reliable. You can find many activities, attractive places, nice restaurants and cafes, sweets shops, traditional handiwork shops and exciting festivals in Kamakura. You might also enjoy riding in a rickshaw, taking a tram, renting bicycles, and especially, walking. Kamakura is a great city for walking! All you want to taste of Japan is here in Kamakura! 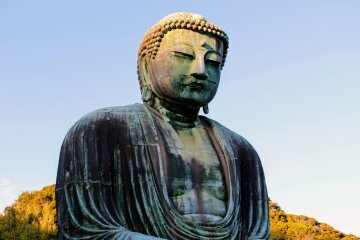 The Kamakura Daibutsu (Great Buddha statue) is an icon of Kamakura and indeed of Japan itself. It was a bronze statue originally built in the mid 13th century. This means that Daibutsu has been sitting there without moving for more than 750 years, just waiting for you! Please stop in and say hello to Daibutsu. Tsurugaoka Hachimangu Shrine used to be the center of this medieval city. Its impressive red roof and a direct connection to the shore along Kamakura’s main road are often shown in guidebooks. If you visit Kamakura in summer, you shouldn’t miss the lotus ponds near the shrine’s front gate. Kita-Kamakura has several high-ranking temples near the station. Engaku-ji and Kencho-ji are two big names. But there are many other refined and peaceful temples to visit as well. The nature of Kamakura is another charm. There are many temples and shrines that have original, simple but beautiful gardens. Flowers, bamboo, bushes and trees compete with one another to show their lovely colors. If you like the waterfront, you should definitely go for a little stroll along the Yuigahama shore. How about buying some tea and sandwiches and then having a picnic on the beach? 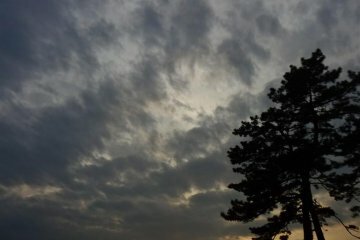 Small islands and the Izu peninsula will be silhouetted against the evening sky at dusk. And in the winter, Mt. Fuji. Stunning! Trekking "Tenen" is an option for nature enthusiasts. It is a three and a half hour course. The best season is autumn. A clear blue sky and sharp red and yellow leaves will welcome you along the route. A tiny tram nicknamed the Eno-den, winds through west Kamakura. It is also quite enjoyable. The tram passes over a single rail that runs between old Japanese houses soon after leaving Kamakura station. 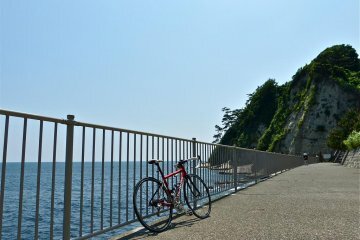 And then, it runs very close to the coast and finally reaches Enoshima. All in all, Kamakura has the potential be the most interesting place you visit in Japan. Enjoy! Kamakura is only an hour away from Tokyo and makes a great destination for a day trip from Tokyo. It has many unique and interesting..
Just as Naoshima is famous for its Shio (salt) cider, Kamakura is famous for its Ume (plum) flavored cider. Plum is grown locally.. In Kamakura, there are many shops that sell soft serve ice-cream; "Imo Yoshi" (いも吉館) is one of these quaint little ice-cre..
With four locations in Japan, "bills" Shichirigahama in Kamakura offers a fantastic classic menu created by Bill Granger, a Syndey-based..
Taisen-kaku is a 100-year-old inn just seconds away from Hase Kanon Temple. 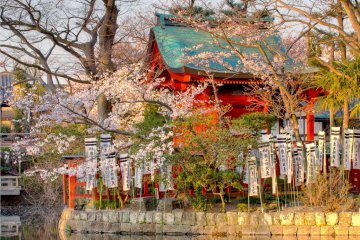 The service they provide will leave you with a memorable..
Close to Tokyo in Japan's Kanagawa prefecture, Kamakura's Hase-dera temple is known for its summer hydrangeas, and is also.. In Japan's ancient capital of Kamakura in Kanagawa prefecture, Chosho-ji is a venerable Buddhist temple, home to some impressive,.. In Japan's ancient capital of Kamakura, Kyo-on-ji is a charming, intimate Buddhist temple, where you can enjoy the peaceful..